The Apple Blog reviewed Jungle Disk 2 today. Jungle Disk is an online backup system built on top of the Amazon S3 Storage Service. It’s quite similar to Mozy, which I previously reviewed, and serves much the same purpose. I haven’t had a chance to try Jungle Disk, but one difference jumps out at me. Mozy charges a flat fee of $0.50 / GB per month (assuming you need more space than their free 2GB MozyHome account. Jungle Disk, on the other hand, charges only $0.15 / GB per month. The catch is that Jungle Disk also charges $0.10 / GB of data uploaded and $0.17 / GB of data downloaded. If you upload only 3GB per month for each GB stored on Jungle Disk, you will come out ahead of Mozy. My Mozy backups are usually pretty small, but sometimes they spike up to 50-100MB (I have the free Mozy Home account and so I only backup a small part of my system). People with large static files or databases (e.g. Daylite databases, video files) that change frequently will probably be better off with Mozy. Others might find Jungle Disk cheaper. I’ll have to do some number crunching to see which way this one will play out for my system. Today Microsoft released Microsoft Office 2004 version 11.5.0. Aside from the usual bug fixes, this version brings with it the ability to read and write the Open XML Office formats (.docx, .xlsx, .pptx, etc) as long as the Open XML File Format Converter is installed. After installing the update, Word now has a Word 2008 Document option in the Save As dialog box. So it seems that you can now create Open XML files as well as edit existing ones. I would do more testing, but I can’t seem to locate any .docx files at the moment. Working directly within Office will certainly make dealing with Open XML files much friendlier. Using the converter was a less than stellar experience (particularly for those who are not computer savvy). Today Macworld is reporting that Marketcircle is bringing Daylite to the iPhone. 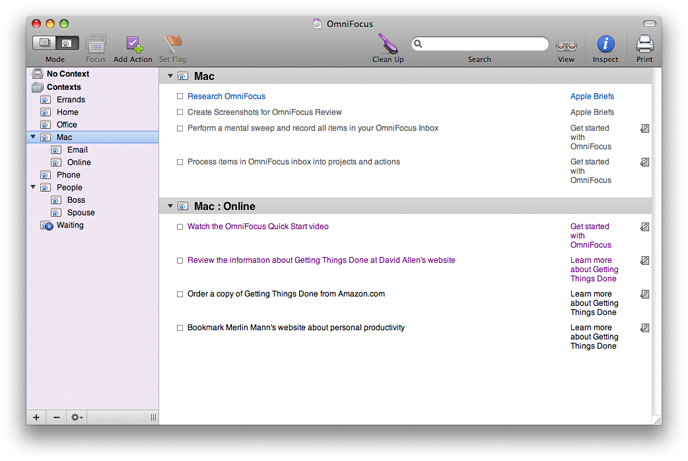 Daylite’s iCal integration is nice, but a lot of the useful information (e.g. 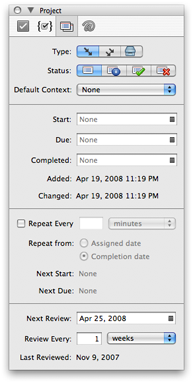 the connections to contacts) doesn’t carry over to iCal. Daylite on the iPhone would be a welcome addition. A couple of weeks ago Marketcircle posted an article on their site called Getting Things Done with Daylite. It’s a nice tutorial on how to use the various tools Daylite provides as part of your workflow. I am sure you were hoping I would post about the new Princess Bride game coming soon to Mac. I’m afraid not. 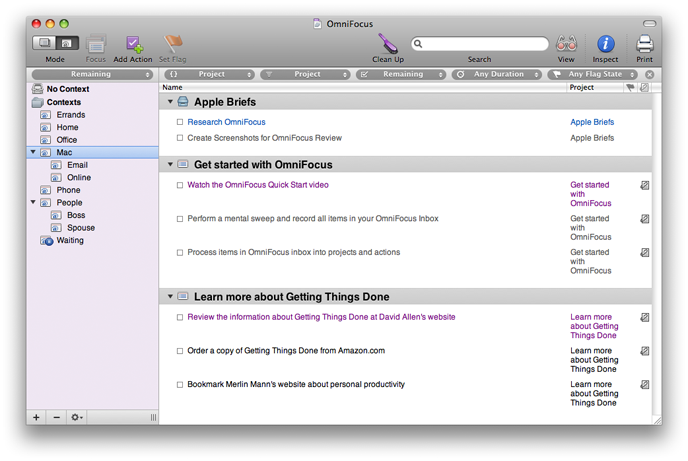 What I do think you should know about is the review of OmniFocus over at TidBITS. 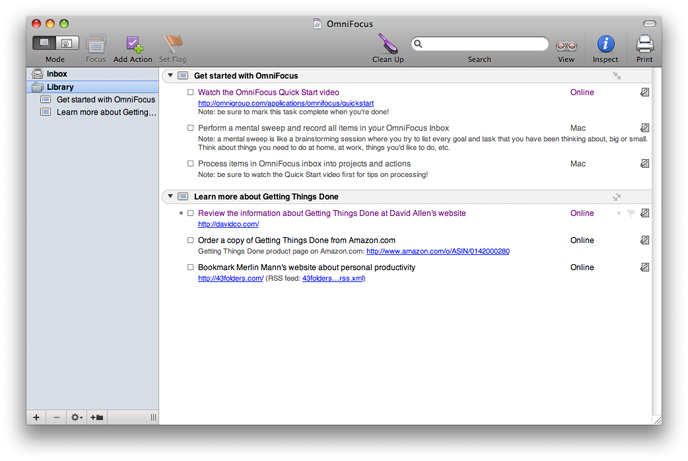 There are also a few screencasts about OmniFocus related to the review. 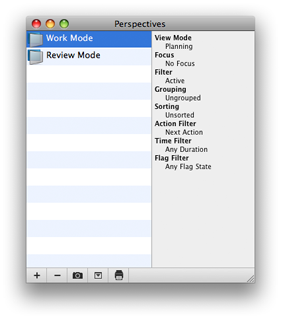 I have been working on an OmniFocus review for a while now. I am almost done, but it appears that my insane-busyness-with-other-things has allowed someone to beat me to the punch. My review is still coming soon, though. So check out the TidBITS review and then come on back here to get a slightly different take on The Omni Group’s GTD application.